A measuring instrument, Linked Ball Bar (LBB), is developed to measure machine tool motion errors quickly, flexibly, and robustly. The LBB employs the concept of double ball bar (DBB) and measures the distance between two balls attached to the spindle and table. The problem of short measurement range, the drawback of the DBB, is solved using a link. The measurement accuracy of the LBB is investigated. The analytical resolution of displacement measurement using the LBB is under 30 nm when the displacement direction coincides with the sensitivity direction. The difference between the LBB and the laser interferometer is less than 1 μm in the center measurement range of 75 mm. The repeatability of the LBB is ±0.4 μm and is at the same level as the interferometer. The kinematic error of a five-axis machine tool is measured using the LBB to demonstrate its validity. The parallelism between the C-axis and Z-axis identified using the LBB agrees with the result measured using the cylindrical square. The difference between the LBB and the cylindrical square is about 10 μm/m at the maximum. The LBB can provide quick and flexible measurements of the motion errors of five-axis machine tools. D. Kono, F. Sakamoto, and I. Yamaji, “Linked Ball Bar for Flexible Motion Error Measurement for Machine Tools,” Int. J. Automation Technol., Vol.11, No.2, pp. 188-196, 2017. S. Ibaraki and W. Knapp, “Indirect Measurement of Volumetric Accuracy for Three-Axis and Five-Axis Machine Tools: A Review,” International Journal of Automation Technology, Vol.6, pp. 110-124, 2012. M. Tsutsumi and A. Saito, “Identification of angular and positional deviations inherent to 5-axis machining centers with a tilting-rotary table by simultaneous four-axis control movements,” International Journal of Machine Tools & Manufacture, Vol.44 pp. 1333-1342, 2004. Y. Ihara, “Ball Bar Measurement on Machine Tools with Rotary Axes,” International Journal of Automation Technology, Vol.6, pp. 180-187, 2012. K. Lee and S. H. Yang, “Measurement and verification of position-independent geometric errors of a five-axis machine tool using a double ball-bar,” International Journal of Machine Tools & Manufacture, Vol.70 pp. 45-52, 2013. C. Hong and S. Ibaraki, “Non-contact R-test with laser displacement sensors for error calibration of five-axis machine tools,” Precision Engineering, Vol.37, pp. 159-171, 2013. S. Ibaraki, C. Oyama, and H. Otsubo, “Construction of an error map of rotary axes on a five-axis machining center by static R-test,” International Journal of Machine Tools & Manufacture, Vol.51 pp. 190-200, 2011. S. H. H. Zargarbashi and J. R. R. Mayer, “Single setup estimation of a five-axis machine tool eight link errors by programmed end point constraint and on the fly measurement with Capball sensor,” International Journal of Machine Tools & Manufacture, Vol.49, pp. 759-766, 2009. Y. Ihara and Y. Hiramatsu, “Design of Motion Accuracy Measurement Device for NC Machine Tools with Three Displacement Sensors,” International Journal of Automation Technology, Vol.5, pp. 847-854, 2011. J. M. Linares, J. C. Jacob, H. Schwenke, A. Longstaff, S. Fletcher, J. Flore, E. Uhlmann, and J. Wintering, “Impact of measurement procedure when error mapping and compensating a small CNC machine using a multilaterationlaser interferometer,” Precision Engineering, Vol.38, pp. 578-588, 2014. Z. He, J. Fu, L. Zhang, and X. Yao, “A new error measurement method to identify all six error parameters of a rotational axis of a machine tool,” International Journal of Machine Tools & Manufacture, Vol.88, pp. 1-8, 2015. K. Iwasawa, A. Iwama, and K. Mitsui, “Development of a measuring method for several types of programmed tool paths for NC machine tools using a laser displacement interferometer and a rotary encoder,” Precision Engineering, Vol.28, pp. 399-408, 2004. S. Ibaraki and T. Hata, “A new formulation of laser step diagonal measurement – Three-dimensional case,” Precision Engineering, Vol.34, pp. 516-525, 2010. S. Ibaraki, T. Kudo, T. Yano, T. Takatsuji, S. Osawa, and O. Sato, “Estimation of three-dimensional volumetric errors of machiningcenters by a tracking interferometer,” Precision Engineering, Vol.39, pp. 179-186, 2015. V. Alessandro, C. Gianni, and S. Antonio, “Axis geometrical errors analysis through a performance test to evaluate kinematic error in a five axis tilting-rotary table machine tool,” Precision Engineering, Vol.39, pp. 224-233, 2015. S. Ibaraki, M. Sawadaa, A. Matsubara, and T. Matsushita, “Machining tests to identify kinematic errors on five-axis machine tools,” Precision Engineering, Vol.34, pp. 387-398, 2010. 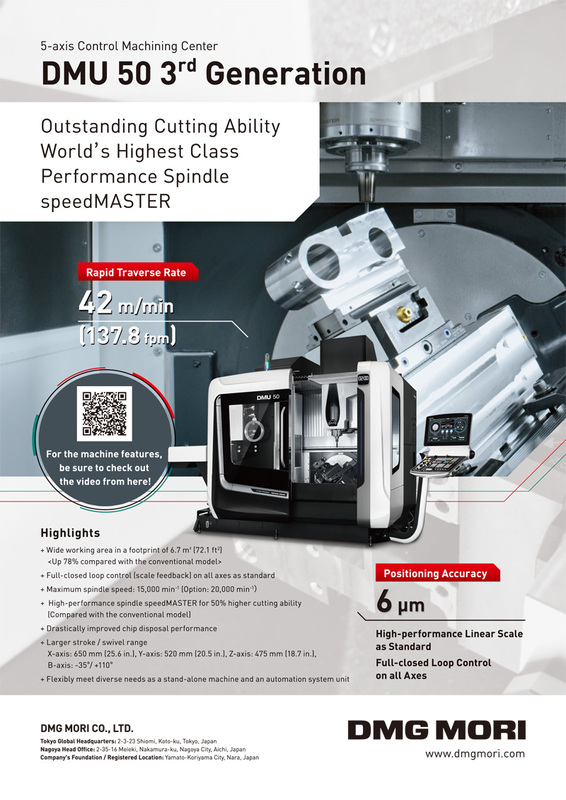 Y. Morimoto, K. Nakato, and M. Gontani, “Accuracy Evaluation of 5-Axis Machining Center Based on Measurements of Machined Workpiece – Evaluation of Accuracy of 5-Axis Controlled Machining Center,” International Journal of Automation Technology, Vol.2, pp. 111-118, 2008. Z. Jiang, B. Song, X. Zhou, X. Tang, and S. Zheng, “Single setup identification of component errors for rotary axes on five-axis machine tools based on pre-layout of target points and shift of measuring reference,” International Journal of Machine Tools & Manufacture, Vol.98, pp. 1-11, 2015. S. Ibaraki and Y. Ota, “Error Calibration for Five-Axis Machine Tools by On-the-Machine Measurement Using a Touch-Trigger Probe,” International Journal of Automation Technology, Vol.8, pp. 20-27, 2014.